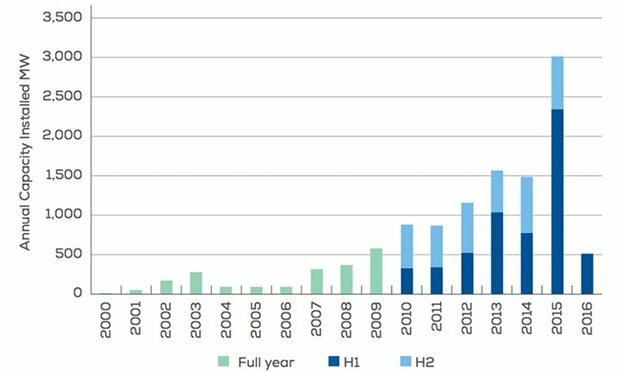 Offshore wind power is getting cheaper. The change is happening dramatically quickly. In July I blogged about the falling cost and mentioned the developer Dong getting prices down to 72.70 Euros per MWh for the 760MW Borssele wind farm off the Dutch coast, which was a new world record for cheap offshore wind power. Now, less than 5 months later, the Swedish developer Vattenfall has won the contract to build the 600 MW Krieger Flak windfarm in Danish water just south of Copenhagen with a price of just 49.50 Euros per MWh (or £43.00 per MWh, which, incidentally, is less than half the cost of what the British government has agreed to pay for electricity from Hinkley C nuclear power station). Further price reductions are forecast over coming months as developers continually improve all stages of the construction of offshore windfarms. Kriegers Flak is interesting for a number of reasons. The initial plan is to build a 600MW windfarm in Danish waters with High Voltage Direct Current connections to the Swedish and German grids, as well as to the Danish grid. This will mean that the electricity generated at Kriegers Flak can be sold into the grids of any of the three countries, wherever has the highest spot market price, and used to smooth fluctuations in supply and demand across the region. Completion of this first 600 MW project is expected between 2018 and 2020. Sweden & Germany both have territorial waters adjacent to the Danish Kriegers Flak, and both have earmarked this area for windfarm development, with a likely total of 1600 MW capacity. This tri-national project, with its super-grid level of interconnections, should help reduce the price of electricity in the three countries, and help them all reduce their carbon emissions. Many people believe that an economy predominantly powered by the wind is impossible, arguing that when the wind stops blowing the lights will go out. Denmark is proving that argument wrong. Already in windy weather they can produce more than 100% of their electrical demand, and as they continue to build bigger and cheaper offshore wind farms like Kriegers Flak it is probable that in windy weather they’ll be generating two or three times their total electricity demand. A great number of energy storage technologies, smart grid and super grid developments mean that they’ll be able to make good use of all this surplus energy and much of it will then be available for when the wind isn’t blowing. This of course adds to the cost, but in all these sectors prices are coming down rapidly as technology improves. The Danish grid is one of the most reliable in the world despite being more dependent on wind power than any other country in the world. By 2035 they expect their electricity and heating sectors to be 100% renewable and for their entire economy to be 100% renewable by 2050. On current progress I think they may well achieve these goals early. Welcome to the new world of a wind powered economy. This entry was posted in Energy on 29 November 2016 by Richard. The Marrakech climate conference has drawn to a close. 195 countries have issued the Marrakech Action Proclamation. The 48 most vulnerable countries have all said they plan to move to 100% renewable forms of energy as quickly as possible. The overwhelming majority of countries look set to transform their economies. Meanwhile Donald Trump is building a team of oddball climate change deniers as the core of his new administration. Many American individual states, cities and companies are urging him not to abandon the Paris Agreement. Some states, notably California, will try and ratify it anyway if the Federal government withdraws. Leadership on climate action is coming from many organisations, from campaigners and activists, inventors and entrepreneurs, businesses and cities, whole countries and regions. I shall be watching that list of the 48 most vulnerable countries with interest. They have the potential to leapfrog out of the fossil fuel era and into the solar era. I’ve written before about Morocco and Ethiopia. Some other countries like Costa Rica are well known leaders. Other members of this group include Burkina Faso, Senegal, Cambodia, Fiji, and Guatemala. Not countries I’d looked at previously in terms of political leadership on climate change and the development of renewable energy. 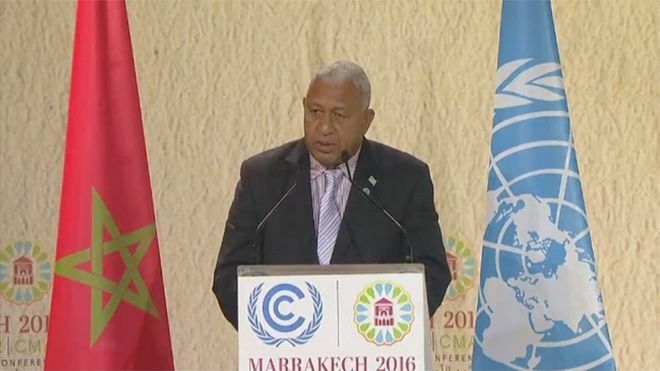 Frank Bainimarama, Fiji’s Prime Minister, is taking over as president of the Conference of the Parties under the UN climate programme. He has appealed to Donald Trump not to abandon the process, and pointed out that climate change is not a hoax. It is to him, and not to Donald Trump, that the world needs to listen. This entry was posted in Climate Change, Politics on 23 November 2016 by Richard. 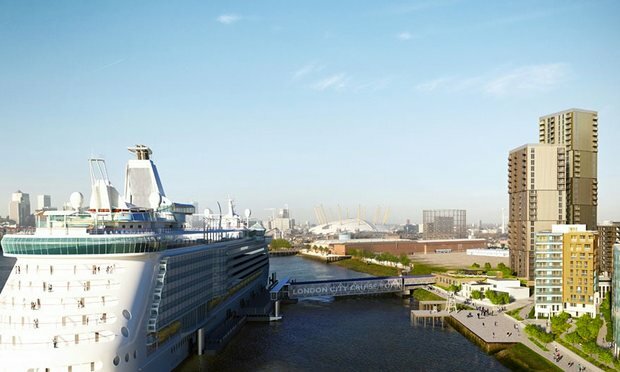 Planning permission has been granted for a new cruise ship terminal in Greenwich. Ships moored in port run their diesel generators to provide power, and this creates terrible air pollution. Yesterday the Radio 4 programme ‘Costing the Earth’ investigated the situation. The answer is simple. Connect the ships to shore based electricity supply so they don’t need to run their generators. This requires some additional investment, but when planning a new port like Greenwich’s cruise liner terminal at Enderby Wharf providing such infrastructure should clearly have been a condition of the planning approval. Los Angeles was the first port in the world to build such a system, back in 2004. By now it ought to be standard practice. Radio 4’s Tom Heap interviewed lots of people in making the programme, but nobody from either local or national government, or the developers, were prepared to talk to him. As ever governments and commercial developers drag their feet, hounded by community groups, health professionals and environmental activists. London has long had air pollution problems, dating back centuries. I was born not long after the Great Smog of 1952 and one of my earliest memories is of my family replacing open coal fires with gas ones as a result of the 1956 Clean Air Act. By the 1960’s pollution from cars was a big issue. On the 1971 ‘O’ level English paper, one of the questions was ‘Should the car be banned?’ I argued that it should. The many disadvantages, including local air pollution, climate change, accidents and communities divided by roads outweighed the benefits. This, I recall, became the policy of the Ecology Party, first called the People Party, (later, the Green Party) when it was formed in 1972-73. Since that time the evidence of the damage to human health has grown very much more detailed. Air pollution from various forms of fossil fuels has long been a problem, for London, and for all big cities. As an issue it has periodically risen up and slid down the media agenda. Now at long last the Cleantech Revolution means that we can still have the many benefits of modern city life, but with radically reduced pollution. Technically much is possible. What is needed is for governments to understand this and take action. Tragically they seldom do, unless forced to do so by the valiant efforts of campaigners and activists, with the support of wonderful organisations like the activist lawyers of Client Earth and insightful radio programmes like ‘Costing the Earth’. This entry was posted in Environmental, Politics, Transport on 16 November 2016 by Richard. 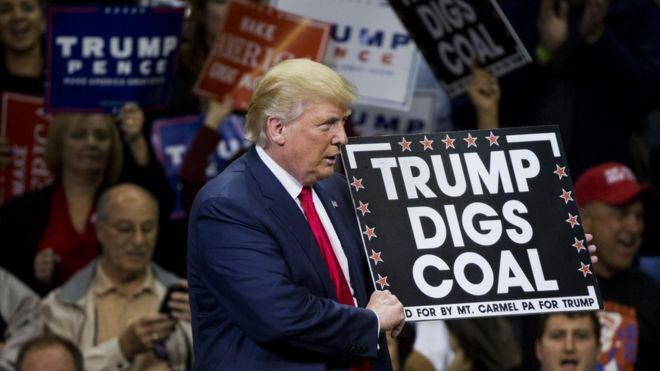 Trump digs coal, calls Climate Change a hoax and becomes President. What does that mean for humanity? When future historians look back at 2016, what will they see as the most significant change? In Marrakech, Morocco, the COP22 climate change talks are underway. The evidence for climate change is utterly overwhelming. Atmospheric CO2 has passed the milestone of 400ppm. Each year sees the global average temperature rise. Glaciers and permafrost are melting, sea levels are rising. Urgent action is required. As I write this Donald Trump has just won the American Presidency. He has described Climate Change as a hoax. I can think of no better parallel than when the Nazi’s described any science they didn’t like as ‘Jewish Science’. Dismissing hard science based on careful study of empirical evidence is a very dangerous path to take. Donald Trump genuinely is a loose cannon. Globally air pollution is re-emerging as a critical issue. This week Delhi has been described as a ‘gas chamber’ and the High Court in London has condemned our government for inaction in reducing air pollution. The solutions to both climate change and to air pollution are a rapid transition from a fossil-fuel based economy to one based on renewables. 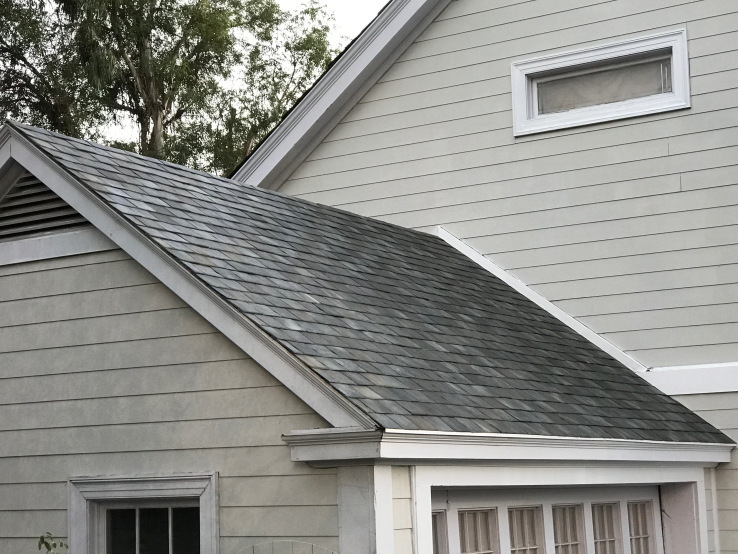 Much of the Cleantech innovation is happening in USA. What effect a Trump victory will have on any of this is hard to tell, but it is very likely that global leadership on these critical issues will move elsewhere. Meanwhile real world events unfold. Sotheby’s have plenty of multi-million dollar homes for sale in Miami Beach. Sea level rise, plus the region’s porous geology and the increasing likelihood of storms and hurricanes make it almost inevitable that these properties will become utterly worthless before long, but exactly when, nobody knows. Trump may be dismissive of climate science, but he is keenly aware of property prices. Atmospheric gases and geological processes of change are completely oblivious to property prices or to the egos of politicians, yet they may dominate the news events of the Trump presidency. This entry was posted in Climate Change, Environmental, Global, Politics on 9 November 2016 by Richard.